Call it an ice-breaker, but we’ve been asked this question—or some form of it—at every introduction. Usually, we get by with a smile and a pithy reply, but given that we’ve been “Drink” since 2010, maybe it is time to delve deeper into the question of who we are and what we do, and why we do what we do. Start-up businesses like Drink face many challenges: from the difficulties of setting up shop, building up the client list, and in general making a name for ourselves in highly competitive fields. As the business grows however, new challenges arise. There is an impetus to redefine and refine. We naturally evolve. In a short span of time, Drink evolved from a company of one to a crowd of kickass employees. As we became increasingly well-known in the field of sustainability reporting and related communications in the Philippines, we faced a new set of challenges. Primarily, we needed to ensure that as we grew and changed, we could maintain the Drink brand. To do this, we launched Project Who with the aim of establishing and strengthening the Drink brand. We first had to be clear about what we do and what makes us different. We next had to make sure that our differentiating factor—what makes us Drink—is clear to those who come into Drink as employees, and those who will work with us as clients. With the help of culture coach Jeff Melnyk of Within People, Drink clarified that our focus is on sustainability, but our passion is to go beyond reporting: to create great stories that connect people. Through a maze of exercises crafted by Within People, Drink was able to hone in on our core strength: storytelling. Drink seeks to humanize data, craft effective and engaging communications, and tell stories that inspire action. Our unique name is definitely a conversation starter, but it causes confusion. While our business name is Drink Editorial and Design, Inc., our clients refer to us as Drink, DrinkPH, DRINK, Drink Communications…the list tends to run on. We needed to settle the issue once and for all. From our business name, we focused on the elements of editorial and design, which are the nuts and bolts of communications. We also wanted people to arrive at the realization that our name is linked with sustainability. 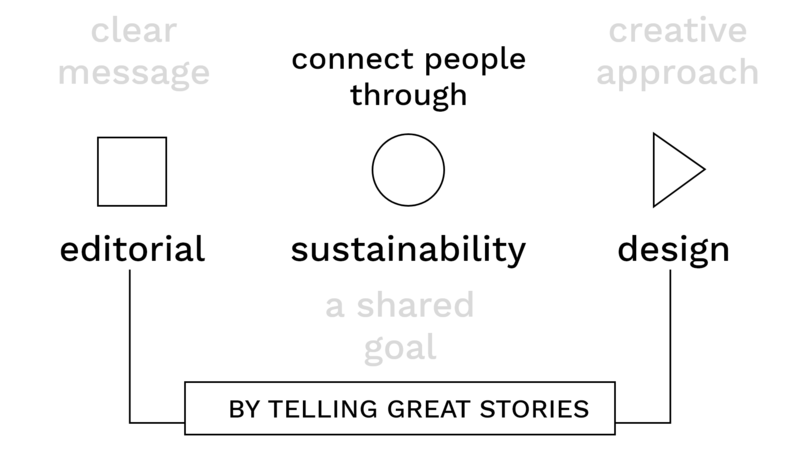 We connect people through sustainability (a shared goal) by telling great stories (editorial and design.) That’s us: Drink Sustainability Communications. To bring the message home, we also revisited and revised our logo to reflect the simplicity and clarity of our mission and our name. We used three basic shapes—a square, a triangle and a circle—to represent the elements of what we do and who we are. From a dizzying array, our colors became streamlined to bright blue, a piece of symbolic history dating to the first Drink brand, and also a bright green, to signal our goal of sustainability. We tell great stories with a clear message (editorial) and a creative approach (design) that embody a purpose (sustainability). Drink connects people through our shared goal of sustainability.